Games chain: Christian youth pastor Ben Thompson is preparing to roll out a prayer chain at the Commonwealth Games. 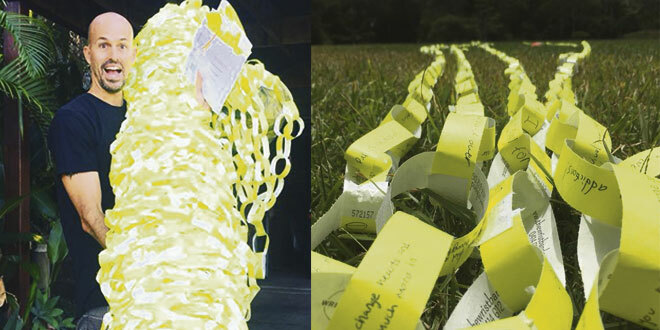 He and other Christians are attempting to create the world’s longest prayer chain. Photos: Supplied. WHILE athletes from around the world prepare for two weeks of record-breaking competition this week, a Christian movement is trying for their own world record. Christian youth pastor Ben Thompson is behind a movement to create the world’s longest prayer chain during the Commonwealth Games on the Gold Coast. Mr Thompson said the world-record attempt would connect Christians from around the globe, including Catholics, who are gathering to watch and pray for their athletes win medals at the Games. “I think Church leaders have been waiting, wanting to unite with other believers,” he said. Several Catholic parishes and schools across Queensland have pitched in to set the world-record attempt by writing prayers on custom-made wristbands. “It has been a genuine blessing for me to be in the privileged position of getting to see prayers from Christians all over Australia and the world all in one place,” Mr Thompson said. “I have seen prayers from six-year-olds in Sydney and seventy-year-olds in America, Catholics in Toowoomba and Baptists on the Gold Coast. “This movement of a physical prayer chain, amassing many kilometres in length, is the closest thing to God’s perspective on prayer that I have ever personally seen. During the Commonwealth Games, the wristbands will be linked together and stretched out along the beaches of the Gold Coast and measured officially for the Guinness Book of World Records. Volunteers from Youth with a Mission will be handing out wristbands to visitors of the games for an opportunity to make the chain even longer. Mr Thompson hopes to beat the existing record of 160km by reaching 177km at the Games. Wristbands for the world record attempt can be purchased from www.thewristbandco.com.au/prayerchain.